I have mentioned before how great it has been to receive my Sew Box Subscription box each month. Not only do we receive great fabric, but get to discover wonderful designers and new patterns. One of our recent boxes include the pattern for MadeByJack'sMum Twist and Shout trousers along with some quality denim. he is 18months old, so I made the size 2 trousers. did the waistband with mock fly & button opening. You can also do the waistband with a zippered fly or yoga style knit band. I couldn't resist adding a truck button to match the truck theme of the fabric. Mr E. was so excited and kept pointing to the truck, looking at us in delight. The pattern was clearly written with a great photo tutorial and went together no problem. It was important to use a denim needle and made all the difference sewing through the thick seams. I chose a red contrast thread for the top stitching. Today, Mr E. came for a visit with his mum & baby brother. 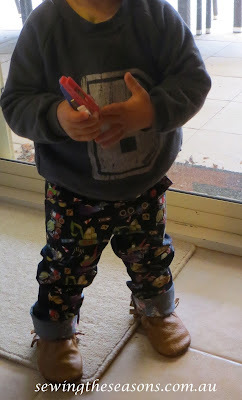 He loved his new jeans and was so cute saying truck. Another great feature of the pattern is the way you have the button hole elastic through the back waistband you can pull up and attach to buttons to get a good fit, and the pattern is designed to work with nappies too. Enjoy the photos of Mr E. in his new jeans. I think he really enjoyed this modelling caper and totally rocks. just wanted to share with you all another great pattern I have discovered. 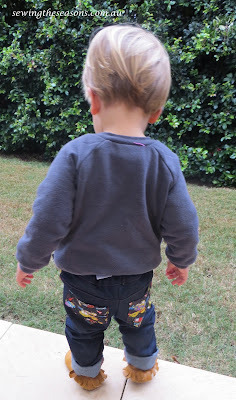 I plan to check out other patterns from Made By Jack's Mum in her online store.